The brachial plexus is the most complex peripheral neural unit. It supplies the arm and hand, allowing expression of the mind through writing, art, athletic endeavor and delicate manipulation of the environment. Injuries to the plexus, therefore, have consequences far beyond the structural damage involved. The significance of injury can best be appreciated by understanding the layers of complexity within the brachial plexus at anatomic as well as functional levels. This serves as an introduction to the physiologic role of the brachial plexus within the functioning of the entire body. It will also hopefully be an entry point into understanding the consequences of derangements of the nerves comprising the brachial plexus in the context of growth and development of the child sustaining injury to the plexus. It will become apparent that although the birth injury in the newborn occurs to the nerves, the main adverse events that follow from that initial injury involve the muscles, bones and joints of the affected extremity. The natural place to begin a study of injury to the brachial plexus is at the structural anatomy, an overview of which follows. The human nervous system is subdivided into the central and peripheral systems. The central system is composed of the brain and the spinal column, from which thirty one pairs of spinal nerves emerge. For classification purposes, the spine is divided into cervical, thoracic, lumbar and sacral regions. Spinal nerve pairs are grouped as follows: eight cervical, twelve thoracic, five lumbar, five sacral and one coccygeal. 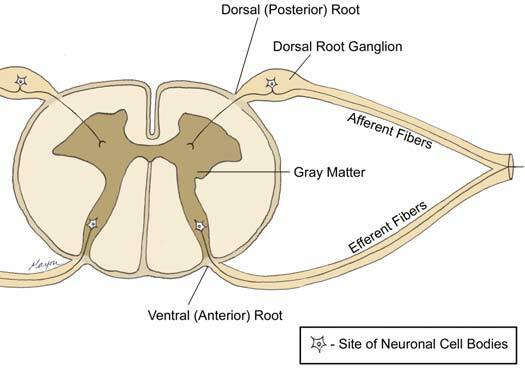 Each spinal nerve is associated with an efferent ventral (anterior) and an afferent dorsal (posterior) root (Figure 1.1). Efferent (motor) neurons carry impulses originating in the central nervous system towards the periphery. Afferent (sensory) neurons carry impulses originating on peripheral sensory receptors towards the central nervous system. The cell bodies of ventral root nerves are located within the gray matter of the central nervous system. Dorsal roots are associated with a ganglion, an ovoid enlargement in which neuronal cell bodies reside. Ganglion cell bodies are bipolar and give off a medial and lateral fiber. Medial fibers extend into the spine to form the actual dorsal root of the spinal nerve. Lateral fibers, on the other hand, make their way to peripheral somatic receptors. A basic understanding of microscopic peripheral nerve anatomy is necessary to understand obstetric brachial plexus injuries (OBPI) and the development of their treatment plans. Individual motor neurons originate with the cell body in the anterior horn of the spinal cord and travel through the body with an elongated axon to the muscles they innervate. The nucleus of the neuron is located within the cell body. Individual neurons are bundled together, in a highly organized manner, with connective and nutritive tissues to form nerves that traverse the body. Each neuronal axon is bounded by its own membrane, the axolemma. The axolemma contains ion channels that maintain the cell�s membrane potential and propagate the action potential. Several Schwann cells will contact an axon along its length. In the case of myelinated axons, Schwann cells provide an insulating sheath of myelin by wrapping around the axon in a spiral fashion. Myelinated axons are capable of rapid action potential conduction. Unmyelinated axons are also in contact with Schwann cells, though more tangentially and without the layers of myelin insulation. The long motor neurons are typically myelinated, while short and interneuronal axons are often unmyelinated. Each of these myelinated nerve fibers, or group of unmyelinated nerve fibers is then surrounded by the endoneurium, made chiefly of collagen fibers. Nerve fibers travel along the nerve bundled into groups called fascicles. The bundled nerves are seated in additional connective tissue, called the perineurium. The perineurial tissue provides the nerve with the majority of its tensile strength3. 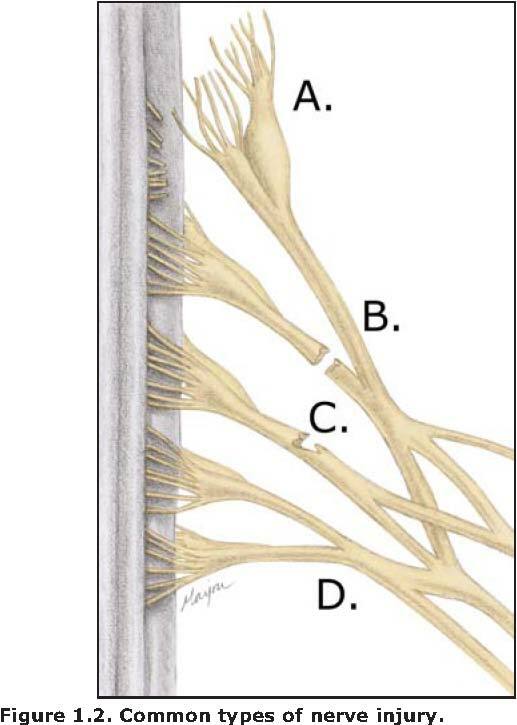 The trunks of the brachial plexus are composed of roughly 55% perineurial connective tissue4. A nerve may contain a single fascicle (monofascicular), a few (2-10) fascicles (oligofascicular), or many (more than 10) fascicles (polyfascicular)1, 2. This organization can change over the length of a nerve. Surrounding the organized fascicles is the epineurium. Where nerves pass over or through joints, connective tissues of the epineurium take up an increased proportion of the nerve�s cross-section, protecting the fascicles from excessive pressure or friction. The epineurium is continuous with a sheath of loosely organized tissue, the mesoneurium, which contacts surrounding soft tissue, including blood vessels, and allows nerves to glide during movement. In functioning motor nerves, an electrical signal is conducted down the length of the axon to reach the motor end plate where it triggers the release of acetylcholine. Injury to the nerve fiber can affect nerve function by interrupting or impeding axonal conduction. This effectively reduces or prevents communication to distal musculature. Injury that disrupts communication between the cell body and distal portions of its axon stimulates Wallerian degeneration distal to the site of the injury. The extent of injury has been usefully classified and described by Seddon, Sunderland, and Mackinnon (Table 1.I, Figure 1.2). The mildest class of injury, called neurapraxia by Seddon and first degree (I) by Sunderland, is a conduction block where the nerve is in-continuity and Wallerian degeneration of distal portions of the axon does not take place. Recovery from this first degree injury is expected within three months. In second degree injuries (Sunderland II), axons are no longer continuous, though the nerve itself remains intact, and will attempt to regenerate through axon sprouting. Distal to the second degree injury, Wallerian degeneration takes place. Healing requires nerve regeneration between the site of injury and the distal end of the nerve. Time of recovery depends on the distance to be covered, averaging 1 inch per month. Therefore, proximal injuries (those closer to the spinal cord) will have farther to travel during regeneration and will require more time to heal than a more distal injury. A related concept is that infants and children will tend to have a faster recovery than adults due in part to the shorter distances that need to be traversed for effective regeneration through to the motor end plates. A third degree injury (Sunderland III) similar to the second degree injury, but during healing, excessive scarring of the endoneurium, the fine innermost connective tissue covering individual nerve fibers, occurs, and this hinders axon regeneration. Recovery will take place at less than 1 inch per month where it is slowed by the scar tissue. The degree of recovery is determined by the degree of scarring as well as which particular fascicles are affected. In more severe injuries, recovery is not expected without surgical intervention. The nerve is still in-continuity in a fourth degree injury as defined by Sunderland. There is, however, scar build up to such an extent that a significant percentage of nerve regeneration is blocked. Surgical intervention is required to reestablish nerve transduction by removing the scar tissue and reconnecting proximal and distal nerve segments directly or with a nerve graft. Second, third and fourth degree injuries as defined by Sunderland were grouped together as axonotmesis by Seddon since the injuries show functional loss and yet nerve continuity is maintained. In contrast, a fifth degree6 injury, or neurotmesis5, describes a rupture or avulsion of the nerve. Due to excessive stretching forces or to mechanical transection, the nerve is no longer a continuous unit. Ruptured nerves, torn distal to the spinal column, have a chance of healing if the gap between proximal and distal segments is short. Recovery usually requires surgical intervention to repair the gap left between proximal and distal nerve segments. Avulsion is a form of neurotmesis transection in which the nerve root is torn from the spinal cord. Nerves torn from the spinal cord have no chance of regeneration, as the tissue of the spinal cord does not regenerate. A related concept is that nerve reconstruction by direct repair or graft in avulsion injury is generally not considered effective. Mackinnon has described a sixth degree injury, also called neuroma in-continuity, that manifests as differing degrees of injury to individual fascicles2, 3. Since the injury is mixed, so is the recovery. This is a useful concept when considering treatment options for obstetric brachial plexus injuries. In obstetric brachial plexus injuries, all degrees of injury are possible, and often there is a mixed pattern in which different portions of the brachial plexus are injured to differing degrees. Each individual nerve can also be injured in a complex fashion. Accurate electrodiagnosis of this type of injury is difficult, and a careful clinical examination is necessary for a more accurate diagnosis and prognosis. In my experience, the majority of brachial plexus injuries in the newborn are stretch injuries without rupture or avulsion, degree I-II in the Sunderland scale. This is recent knowledge implied from treatment outcomes of the muscle and bony deformities that flow from the initial nerve injury.